Launched under the newly rebranded Signify (formerly Philips Lighting), Hue Lily is a series of outdoor LED spotlights, able to reproduce millions of different colors to elegantly light a porch, patio, walkway, etc. It also has the ability to be extended outside of what the trio included in the base kit, which is what we are reviewing today. Let's see in the box! Inside the main box is... a series of smaller boxes. This is actually helpful because there are quite a few different components going on here, and by sorting it all out of the gate it is a bit easier to understand what you've got. Each of the smaller boxes contains one of three spotlights, and a stake for going into the ground. The biggest of the four boxes contains all the cables, splitters, and other odds and ends necessary to get the lights and up and running. As far as the cables, there are three low voltage 197" extension cables, two connectors, and a power adapter with a 137.7" cable attached. All in all, that adds up to more than 60 feet of distance that can be covered by Lily. Since it can be expanded, each add-on kit comes with another spot, a connector, and one of those long extensions. Getting up and running only took us a few minutes and was no more difficult than any other Hue lights. We simply plugged them in and added them to our home with the Hue app. For light placement, there are two options. The mounting plates, which come pre-attached, or the in-ground stakes. We are used to so many cheap outdoor lights that skimp on the stakes, but these screw securely into place and are made entirely out of metal. As in the build quality as a whole, we were quite impressed in how these will hold up. There doesn't appear to be any screws, so if you'd like to use the mounting plates to affix them to a wall, you'll have to provide your own. Otherwise, it is pretty effortless to put the stakes into the ground wherever you'd please, especially with such lengthy bouts of extension cord in between. Attaching all the cords takes just a few moments as each connector and cord has a mini collar that needs to be screwed into place, which is due to the amount of waterproofing present. Placement will be key with these lights, as they need to be able to connect to the Hue Bridge on the inside of your house. There is quite a bit of range, and we had no issues on our smaller installation, but placing them really far away from the house will be an issue. Hue lights use Zigbee, which is able to create a mesh network between all of the different lights, extending its range. Instead of needing to connect directly to the Hue Bridge, they can instead connect to another bulb that bridges the gap between the Lily and the bridge. This does however create a slight delay when sending commands. It is hard for us to say with certainty if connection will be a problem for each person's home, but as long as it is relatively close, or there are other Hue bulbs in between them and the Bridge, it should be fine. Tell us about the spotlights! Each of the spotlights are made of aluminum with a matte finish on the exterior. That gives it a solid feel and premium construction. These are sealed to achieve that IP65 waterproofing rating, which should protect from dust and jets of water. We wouldn't go submerging these, but they are more than protected for outdoor use. They are quite adjustable, with a thumb screw located on the side that can be loosened to allow the spot to rotate from one side to the other and anywhere in between. While this lets them rotate up and down, there is no mechanism in place for rotating horizontally, so you have to angle them when you are placing them. Each light is capable of putting out 640 lumens of directional light. In the few areas we tested this out on, it was quite sufficient, but we would expect those with larger installations maybe hoping for a bit more output. That has been a trend with the Hue lights, always putting out slightly less light than some competing bulbs. Here however, there are no competing outdoor HomeKit lights. As is such with their flagship indoor bulbs, these are capable of not just different shades of white, but a vast color spectrum as well. This can make lighting your exterior much more fun as you slide through the color wheel. Some of Hue's outdoor lights don't come with color, and honestly, we much prefer the option. Like all recent Hue lights, Lily works with HomeKit. The base itself connects to the Hue Bridge (which is required, and not included). That second generation Hue Bridge is actually the device that connects to HomeKit, then any lights added to the bridge will also appear. If you already have a Hue setup, once you add Lily to the Hue app, you must sync your Hue setup to the Home app, by going into the Hue settings. It will alert you of this by ways of a series of exclamation points, but it still can be a confusing thing to do compared to other HomeKit accessories that don't need to "sync" across. Once in the Home app, the lights appear individually where you can adjust the brightness, white temperature, or the color. This works same as any other HomeKit light. - Quick tip: If you want all the lights to be controlled together, group them together into a single unit by going to the accessory > settings > Group with other accessories > choose the three Lily spotlights. Possibly even more so with these exterior lights, there are lots of great ideas for automation. In the Home app, the last tab (called Automation of course), houses all of the ones that have been set up. A few of the most common automations will be having the lights turn on and off based on the time of day (or around the sunrise/sunset), turning on the lights when an exterior door is opened, turning on when someone arrives home (as well as turning off when someone leaves), turning on with a wall switch connected to other outdoor lights, and trigger by a motion sensor watching the area. In our testing, we used two of those automations. We used a Fibaro door/window sensor on our sliding door to trigger the lights whenever the door was opened after sunset. That way we could see when taking the pups out. Secondly, we used the motion sensor in our Logi Circle 2 camera that is covering our back patio. If someone would venture in to our area at night, not only does the camera catch them on video, but the lights trigger. This will hopefully scare them away, as well as provide better light for our camera. Of course, they are handy for entertaining too, creating some nice accent lighting. We don't have much bad to say about the Hue Lily outdoor spotlights. They do exactly as they are meant to, and work well with HomeKit. The biggest limiting factor will be placement, taking signal strength into consideration. It is also a bit of a downside that the bulbs themselves aren't replaceable, needing a new unit should they ever burn out. They are rated for 25,000 hours (which is roughly three years if running 24 hours a day) so it isn't something that should happen anytime soon, and the included two year warranty should help if they ever would die out early. 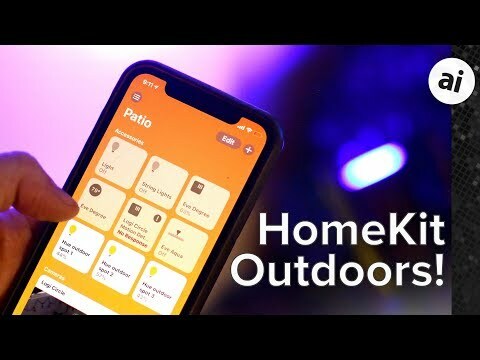 As huge smart home and HomeKit fans, we are thrilled that HomeKit is finally venturing into the outdoors. To date, we've only seen a couple HomeKit products that were designed for the exterior of our homes, and now that Signify is launching all of these new outdoor bulbs, we can finally control our whole home - inside and out - through HomeKit. Right now, Philips Hue Lily is still new and harder to find. You can currently find the base kit with three lights from Dell for $279, with wider availability expected soon. I currently have 5 Hue colour bulbs and two light strips. I enjoy what I can do with them mood wise, but abhor the idea of paying for a fixture that essentially lasts as long as the life of the bulb. Not too much of a hit with this kit, but some of the other upcoming fixtures (i'm looking at you, mirror) are quite expensive $250 USD. Not a fan of light fixtures becoming non upgradable/updatable appliances. $93 per light is just ridiculous! The casing is not even brass, so you can't use them on salty environments. Let's hope that when Apple finally start integration with Thread we'd see more affordable HomeKit devices. Everything on the market right now is unreliable, extremely expensive and/or complicated (because you need a hub per brand). Are we really living in a day and age where a light company sells light fixtures with non replaceable bulbs? How much more trash do we want to produce? This is a deal breaker for me, and it should for everyone. The greed of these companies at the expense of the environment has no limits. Let’s send a message by not buying. How hard can it be to create a waterproof case.